Separate versions of PlayMaker Pro are available for Microsoft Windows, Apple's Macintosh OS X and Apple's iOS devices - iPad, iPhone and iPod Touch. PlayMaker Pro utilizes the operating system in your computer to create drawings for you. You don't need to install anything but PlayMaker to get it to work. Windows, Mac OS X and iOS take care of everything for you. This is what PlayMaker Pro 4.6 looks like running on a Microsoft Windows 7 computer. It has tools across the top that let you select things, and create text, lines, and boxes. Next, Prev, and GoTo buttons let you change pages within a document. The Show button lets you give a slide show. PlayMaker Pro for Windows is compatible with Windows XP thru Windows 10. 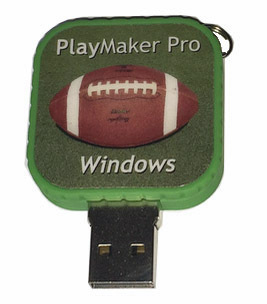 PlayMaker Pro for Windows is delivered on a USB flash drive so you can install it on your modern computer. This is what PlayMaker Pro looks like running on a Macintosh. It has tools across the top that let you select things, and create players, lines, boxes and text. Next and Prev buttons along with the Table of Contents on the left side let you change pages within a document. You can build documents faster using the Template Library on the right. The Run button lets you run animations. The Show button lets you give a slide show. 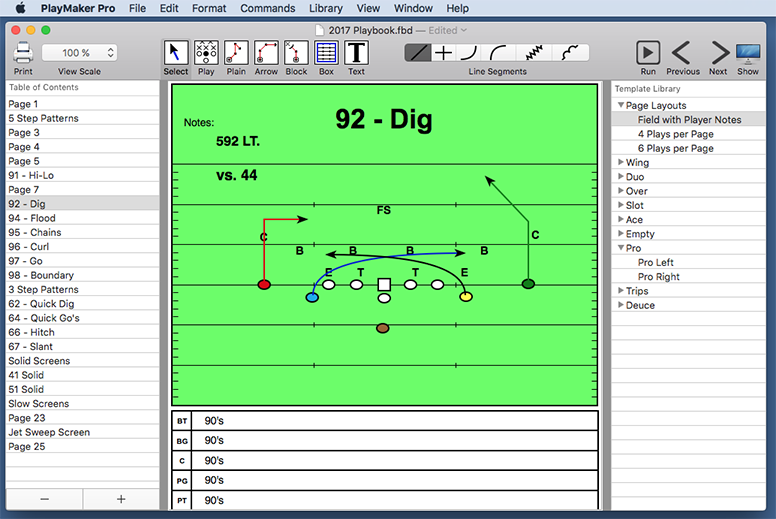 The PlayMaker Pro screen shown above is from version 5.0 for Macintosh. Version 5.0 is a new modern version introduced in 2017. Version 5.0 for Macintosh can also export JPEGs, PNGs, PDFs and Windows BMP files. You can give presentations on an attached display / TV / projector. Presentations can include animation, scribbles, toggled elements and video. You can record those presentations and export them as MPEG-4 videos. PlayMaker Pro for Macintosh is a native OS X application. It requires Mac OS X v10.9 or newer. It will work with Mac OS X v10.9 (Mavericks), Mac OS X v10.10 (Yosemite), Mac OS X v10.11 (El Capitan). macOS Sierra (Version 10.12), macOS High Sierra (10.13) and macOS Mojave (10.14). PlayMaker Pro 5.0 for Macintosh is available as a team license. We send it to you on a USB flash drive. A personal version of PlayMaker Pro 5.0 for Macintosh is now available at Apple's Macintosh App Store. The App Store version is copy protected and licensed to an Apple ID. Updates for the personal version are delivered through Apple's normal software update process whenever we fix a bug or add a feature. The personal version is less expensive too. This is what PlayMaker Pro looks like running on an iPad. 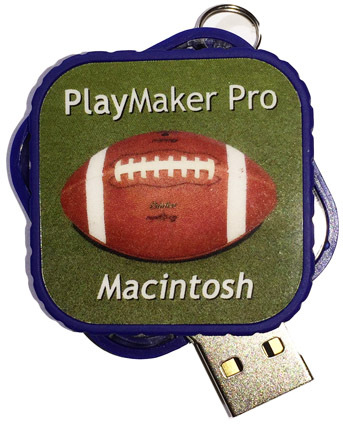 You can view PlayMaker Pro documents that you have created with the Macintosh or Windows versions. Currently, it supports American Football, Canadian Football and Basketball. PlayMaker Pro for iOS is available from Apple's App Store for Free as a PlayMaker Pro document viewer for iPhone, iPod Touch and iPad. 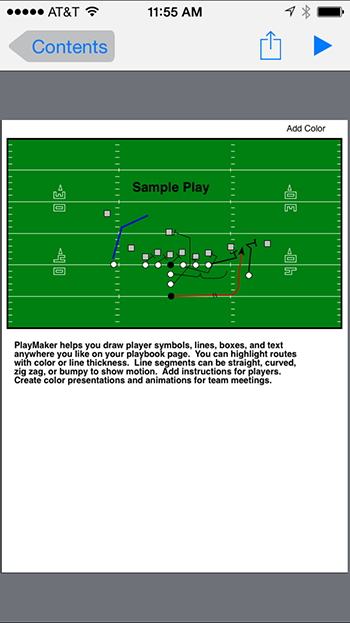 This product lets you display PlayMaker Pro documents and animate plays. 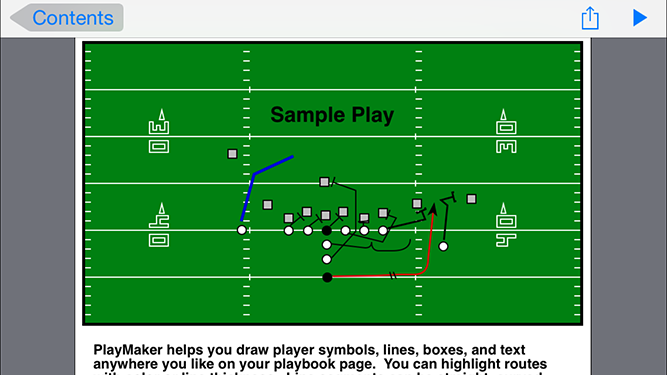 Use it to take your drawings to practice or share them with coaches or players who have an iPad, iPhone or iPod touch. PlayMaker Pro for iOS can also email PlayMaker Pro documents as pdf files. 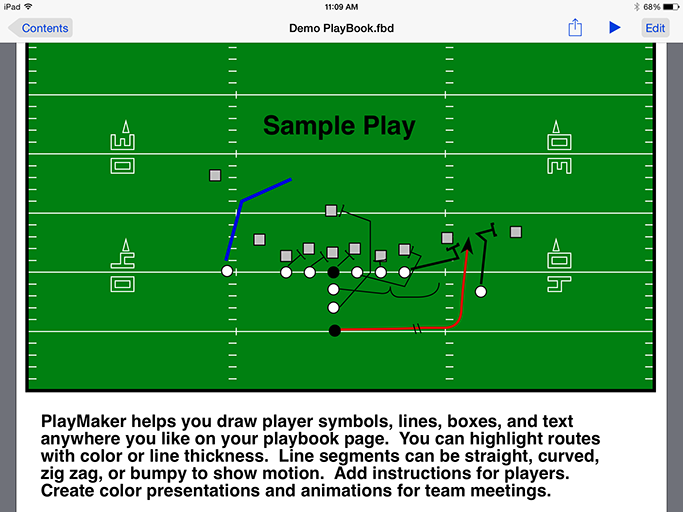 iPad users can purchase the ability to create and edit PlayMaker Pro documents for an additional $49.99. You can demo the editing features for free, but you'll need to purchase "Document Editing" from within the iPad app to save or print your work. You can move documents from Macintosh or Windows computers to an iPad / iPhone / iPod Touch using the File Sharing feature of iTunes. You can also email a document whose name ends in ".fbd" or ".bbd" for football or basketball. Apple's Mail app will hand off the ".fbd" or ".bbd" document to PlayMaker Pro. Modern Mac users can AirDrop documents to their iPads. You can also use iCloud Drive to transfer documents to an iPad /iPhone / iPod Touch. Drawing plays on an iPad works similarly to drawing plays with the Macintosh or Windows versions of PlayMaker Pro, you just point with your finger instead of with a mouse. You may want to use a stylus so your pointer will be smaller and more precise. Compared to the desktop versions of PlayMaker Pro, the iPad version does not have the Library feature, and does not export jpg and png files. Otherwise, its all there. You can draw players, lines, boxes and text in color or black & white, copy and paste, flip plays, reverse plays, enlarge / reduce plays, zoom in on your work, align, animate and present with player notes, scribbles, images and video. You can display your drawings on a Projector either using Screen Mirroring (requires iPad 2 or newer) or as a 2nd display. You can animate plays similar to the desktop versions of PlayMaker Pro. You can display player notes in a presentation. You can also scribble in red over your drawings while using a projector. You can print a page or a whole document from an iPad, iPhone or iPod Touch. You can email a document as a PDF. PlayMaker Pro for iOS is a Universal iOS application. It works with iPads, iPhones and iPod Touch devices running iOS version 11.0 or newer. Your documents will look much better on an iPad than an iPhone because it is much larger. The iPad screen shot above was reduced to fit on this web page. PlayMaker Pro for iOS looks the best on Apple's Retina Displays. You can not edit plays on an iPhone or iPod Touch. The iPhone example above can be scrolled up and down to reveal the entire contents of a page. You can also hold your iPad / iPhone / iPod Touch in the portrait orientation to see a full page. 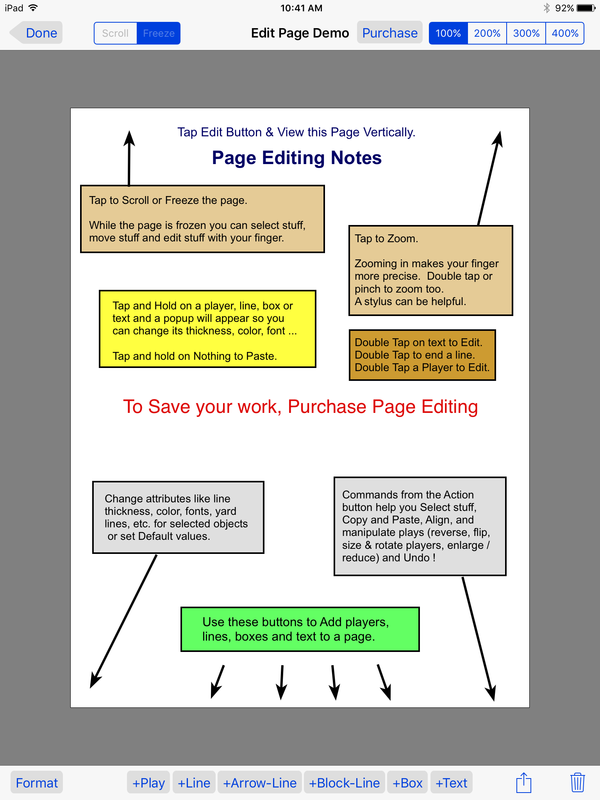 PlayMaker Pro documents can have a Landscape Page Setup. 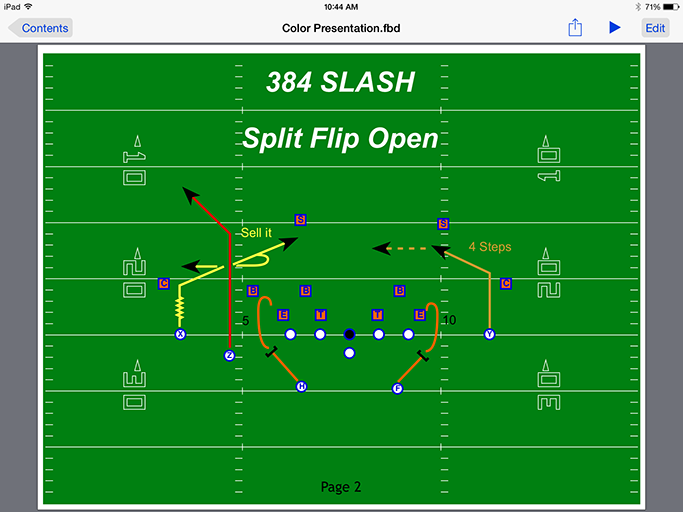 This feature is often used to draw really large plays for cards for practice. A play card on an iPad would look like the example below. Don't take a pile of paper to practice - just take your iPad. PlayMaker Pro for iPad's editor is shown below. A sample document containing instructions is included and includes the page shown below. If you know how to use PlayMaker Pro for Macintosh or Windows, you'll figure out the iPad version in a few minutes. You can purchase PlayMaker Pro for iOS at Apple's App Store.